Should Juande Ramos try to bring Fredi Kanoute and Daniel Alves to Spurs? Tabloid hacks with the ability to put two and two together â€“ there are some out there â€“ have naturally decided that Juande Ramos, Spurs’ new head honcho, will raid the changing room at his former club Sevilla. Which all means that we’ll be seeing the likes of Fredi Kanoute and Daniel Alves playing at White Hart Lane soon enough. 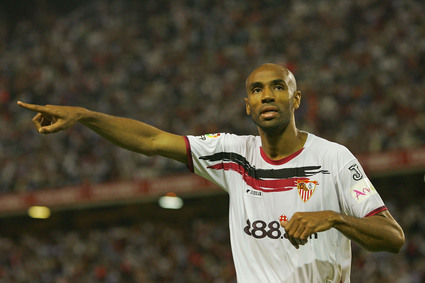 I doubt Sevilla would part with Alves for the money Spurs could afford, but I could see Kanoute returning to the club. Kanoute blew hot and cold when he was at Tottenham. On his day he could be as devastating as Thierry Henry. But when he was bad, he’d struggle to find the barn door, let alone hit it. However, Ramos seems to have turned Fredi into a genuinely good striker â€“ proof, the experts say, of how good a coach he is. Problem is, Spurs don’t really need another striker (how they’d love to swap Darren Bent for Kanoute, I’m sure) â€“ they need quality in central midfield. The likes of Zakora, Huddlestone, Tainio and Jenas can’t compete against the very best in the Prem.